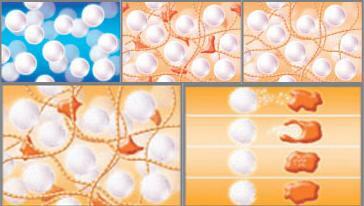 This filler is composed of calcium hydroxyapatite (CaHA) microparticles suspended in an aqueous gel. When injected under the skin, the immediate effect of the same is to fill, increasing the facial volume to give the skin a smooth and natural look. The change is appreciable immediately. Over time, the body gradually absorbs the gel, but the tiny, fine microparticles remain. Once injected, it initiates a process called neocolagenesis or production of new collagen. This process stimulates the body to produce new collagen and promote growth of the same around the injected area. The Hydroxyapatite Calcium filler immediately softens and corrects facial features, is biocompatible not requiring waiting for allergy test results, and being biodegradable adapts to the aesthetic needs of the ever-changing face. JUVILIS NIGHT CREAM, Hydroxyapatite in cream! The particles of Tricalcium Phosphate (B-TcP), when injected, produce a tissue stimulation of the fibroblasts that causes the synthesis of collagen, which in turn helps the redensification of the dermis. It acts in a progressive and lasting way (12 months). The tricalcium phosphate particles cause a tensor effect that attenuates and / or eliminates wrinkles, lines of expression and scars stimulating the production of collagen in the skin. It is a facial remodeler that produces the progressive and long-lasting synthesis of collagen, eliminating sagging. It gives firmness and volume to the skin. It reactivates the production of collagen in the skin giving a more healthy and luminous appearance. JUVILIS DAY LOTION AND JUVILIS BEAUTY SERUM, Tricalcium Phosphate in cream! Hyaluronic acid (HA) is a β-linked glycosaminoglycan polysaccharide with a structural function, like chondroitin sulfates. Viscous texture, exists in the synovium, vitreous humor and connective tissue collagen of numerous organisms and is an important glycoprotein in articular homeostasis. In humans, its concentration in the joints, cartilage and skin is remarkable. In a human of 70 kilograms of weight there may be a total amount of 15 grams of hyaluronic acid, one third of which is degraded and synthesized each day. The cross-linked hyaluronic acid is formed by hyaluronic molecules linked together by Van der Waals bridges that create a mesh-like molecular structure and form structures by joining their molecules, this bonding process creates volume. In aesthetics it is used to give volume and eliminate wrinkles. On the one hand, by injections, the folds of the skin are filled. On the other, thanks to its revitalizing action and its moisturizing properties, the entire cellular ecosystem improves. Crosslinked hyaluronic acid is the safest substance that has been discovered to date because it is found in our own skin, along with collagen and elastin, forming a natural beam that interweaves giving it firmness. It is also part of our joints, the vitreous humor of the eye or the umbilical cord. This prevents rejection by the body when injected again. As the molecules that compose it do not bond together, they remain with the same tiny size, flowing freely, and capable of infiltrating the skin thanks to its microscopic size. This property of the free molecules produces that the external non-crosslinked format can be applied in the form of a cream for the skin, serum and other products available in different brands. In addition, as reinforced with other substances such as collagen or vitamin C, uncrosslinked hyaluronic acid will create an amalgam of beneficial effects for a heterogeneous group of people: age, skin type, etc. Nourishing creams can not reach this deep layer of the dermis so they are not effective to rejuvenate the skin, instead, the mesotherapy directly regenerates where needed and where degraded over time. The exclusive technology of Juvilis, Fillertrans®, allows for the first time to transport the particles of hyaluronic through the follicles! JUVILIS EYE COMPLEX has 3 types of hyaluronic acid!